There is an intriguing quality to biomedical research: A discovery does not always predict its future uses. As a consequence, it is essential that the Nation continue to champion broad-based studies of both the normal and the disease processes. These studies will yield a fundamental understanding of biological systems and will provide us with the foundation of knowledge needed to ensure successful responses to current and future health problems. Indeed, biomedical ‘miracles’ aren’t simply stumbled upon but result from the dedication and determination of talented humanitarians in both research and government. And at the helm in government is the National Institutes of Health (NIH), a part of the U.S. Department of Health and Human Services, the nation’s medical research agency and the largest source of funding for medical research in the world. More than eighty Nobel prizes have been awarded for NIH-supported research. Thanks in large part to NIH-funded biomedical research, Americans today are living longer and healthier. Life expectancy in the U.S. has risen from 47 years in 1900 to 78 years in 2009, and disability in people over age 65 has dropped dramatically in the past 30 years. In recent years, nationwide rates of new diagnoses and deaths from all cancers combined have fallen significantly. While improving health for patients in the United States and around the world, health research plays an essential role in the nation’s economic growth. In 2010, spending on U.S. healthcare hit $2.6 trillion — health research accounted for only 5.5% ($140.5 billion) of total healthcare spending . Nevertheless, that $140.5 billion was a great investment; every dollar invested in federal research spending generates about $2.20 in total economic activity in communities that host funded projects . 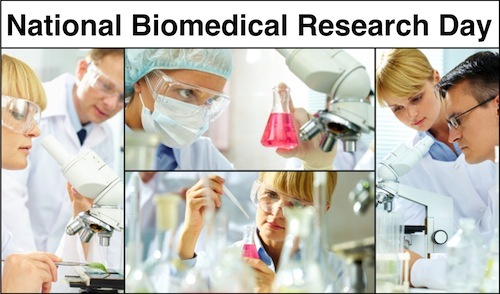 For these reasons, biomedical research has broad public support. Indeed, most Americans (78%) think federal funding for health research is important for job creation and the economy. Moreover, 76% think global health R&D is important to the U.S. economy and 61% say accelerating our nation’s investment in research to improve health is a priority . As millions of baby boomers rush towards retirement age, when afflictions and diseases take a much higher toll, biomedical research becomes more urgent than ever. As we celebrate National Biomedical Research Day this year, let us be mindful that funding for research not be sacrificed in an effort to cut healthcare costs. Biomedical research has increased the lifespan of people in the U.S. through the development of antibiotics, vaccines, treatments and medical devices, and contributed to the elimination of many epidemic diseases, such as cholera, smallpox and yellow fever. It is only from the continued support for biomedical research that more effective cures and therapies will emerge. Alfred Nobel. Nobelprize.org Accessed 2011 Oct 18. William J. Clinton: Proclamation 6616 – National Biomedical Research Day, 1993. The American Presidency Project. Accessed 2011 Oct 18. 2010 U.S. Investment in Health Research. Research!America. Accessed 2011 Oct 20. In Your Own Backyard: How NIH Funding Helps Your State’s Economy. Families USA. 2008 June. Your Congress. Your Health. Research!America. Accessed 2011 Oct 20.